A symposium moderated by Jaclyn Meloche, PhD. Curious about the changing economy of the university, the new kinds of structures that are characterizing fine arts departments in academia and the precarious role of the artist in the classroom, Jaclyn Meloche asks, does John Chandler and Lucy Lippard’s argument that makers must be thinkers, and vice versa still ring true today? ; [s]ometime in the near future it may be necessary for the writer to be an artist as well as for the artist to be a writer. There will still be scholars and historians of art, but the contemporary critic may have to choose between a creative originality and explanatory historicism. [i] Although uttered thirty years ago, this notion is still relevant and considered amongst artist-scholars invested in academic debates about theory and practice. Why? Research-creation. Practice-led research. Arts-based research. These are some of the terms being deployed within the academy to frame the ways in which practitioners are contributing to the production and dissemination of knowledge. Moreover, these terms have also become embedded within the rhetoric exploited by granting agencies and universities to fund art as research. In theory, much has been argued and written about in support of the changing economies surrounding artists and their contributions within academia. But are universities today truly embracing the notion that art is a method, or rather system through which to perform research? Furthermore, are monodisciplinary faculty supportive of said contributions within their departments? In response to the rising number of interdisciplinary PhD programs that are blossoming around the globe and the growing number of artists working within interdisciplinary practices, Meloche has curated a panel of artist-scholars, all of whom are at different stages in their academic career, to respond to the questions: why should an artist pursue doctoral research? How do artists with PhD’s fit into the traditional academic model of the university? And, what kinds of contributions can artist-scholars make to what Ian Angus calls the preservation of intellectual heritage? [ii] In the form of a day-long symposium, each speaker will consider, through personal definitions, experiences, and intertwined practices of art and research the ways in which [d]oing, reading and writing [qualitative] research are part of the same complex craft. 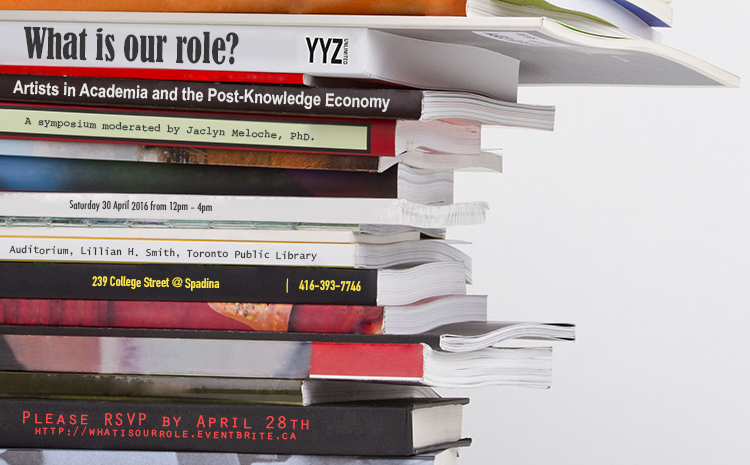 [iii] YYZ invites a diverse audience that includes artists, professors, researchers, curators, students and anyone else interested in a discussion about the futures of artists, arts education, and pedagogical models of interdisciplinarity within the academy. A publication will be available for purchase at yyzbooks.com. Ryan Stec, PhD Student, Azrieli School of Architecture and Urbanism, Carleton University and Artistic Director at Artengine, Ottawa, ON. Event is hosted by YYZ Artists’ Outlet, an artist-run centre. [i] John Chandler and Lucy Lippard, The Dematerialization of Art, Art International, Vol. 12, no. 2, February 1968: 31-32. [ii] Ian Angus. Love the Questions : University Education and Enlightenment. (Winnipeg : Arbeiter Ring Publishing, 2009), 11. [iii] Lynn Butler-Kisber. Qualitative Inquiry : Thematic, Narrative and Arts-Informed Perspectives. (London : SAGE Publications, 2010), 1.